Volkswagen AG said its merger with Porsche SE can no longer be completed by the end of the year as originally planned because of pending lawsuits. "From Volkswagen's perspective, the continuing legal hurdles mean that it is currently impossible to quantify the economic risks of a merger and therefore to perform the valuation of Porsche SE," VW said in a statement Thursday. "The main causes of uncertainty are the ongoing proceedings and actions brought against Porsche SE in Germany and the USA for alleged market manipulation," it added. The automaker said it would now examine other ways to create "an integrated automotive group" with Porsche and present any findings to the supervisory board before the end of the year. 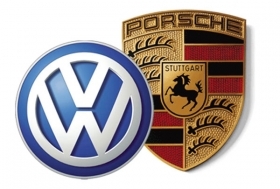 Porsche and Volkswagen agreed to combine in 2009 after Porsche racked up more than 10 billion euros ($14 billion) of debt in an unsuccessful attempt to gain control of VW. The carmaker used 4.9 billion euros ($6.9 billion) raised in a rights offering this year to cut debt below 1.5 billion euros, fulfilling a prerequisite for a merger with VW. The planned merger with Porsche, which owns 51 percent of VW's common stock, was originally scheduled for completion in the second half of 2011. German legal obstacles and an investigation into share-price manipulation allegations will likely push the deal's completion into 2012, Porsche said Feb. 24. Volkswagen now owns 49.9 percent of Porsche's carmaking operations. Short sellers of VW stock have sued Porsche in the U.S., claiming the carmaker secretly piled up Volkswagen shares and later caused the investors to lose more than $1 billion. At the same time, institutional investors in Germany are seeking 2.5 billion euros in damages over the matter. James B. Heaton III, a lawyer with Barlit Beck Herman Palenchar & Scott LLP, who is representing hedge funds suing Porsche, said: "We have no comment except to say that we will continue to press our claims against Porsche in both state and federal court in the United States." Porsche has repeatedly denied all the allegations. As part of the original deal struck in August 2009, VW can also pay cash for the remaining 50.1 percent stake in Porsche's automobile operations by using a put/call structure that allows the sports-car maker to sell the rest of its core business to VW. Those options could be realized between November 2012 and January 2015. "All parties remain committed to the goal of creating an integrated automotive group with Porsche and are convinced that this will take place," VW said in the statement.